There are different types of interviews. Do you know them? - Southeast KANSASWORKS, Inc. There are different types of interviews. Do you know them? 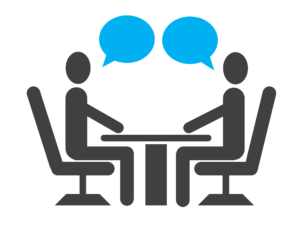 Most people think of the typical one-on-one type of interview when they think of an interview, but there are many kinds of job interviews. Knowing what type of interview you will be having will help in your preparation. This is the most common type of interview, where one person will be interviewing only you. In a group interview, several candidates are interviewed at once. The purpose of this type of interview is usually to see how you act in a team situation and how competitive you are. Your group might be given a task to perform together. Those who contribute the most to the group will be considered first for open positions. There may be employees of the company mixed into your group, but you won’t know who they are. In this type of interview you are interviewed by a panel of several employees of the company. The key to success in a panel interview is to interact with each member of the pane. Make eye contact. Answer questions asked by any of the members. Look for specific concerns form individual members and try to address them. Be aware that the team may play “good cop, bad cop.” One may actually be confrontational while the second may appear to be your friend. This is not a common procedure but it’s important to be prepared just in case. Often, several interviews will be setup with different members of the same company. If this happens, try to find out in advance what the schedule will be so that you will know how much time you have with each person. Use what you learn about the company and the tasks of the position in one interview to present yourself better in the next. Be sure ot get the business card of each interviewer so you can send them all thank you notes.